Bought in 2002 by Pierre Gaillard of St Joseph in the Northern Rhone, the stunning location of Madeloc is matched by the wines which, since 2009 have been made by Pierre's daughter Elise. Quartz, schist, mica-schist, slate and pelites are all found in the Gaillards' parcels which are situated on terraces overlooking the sea, surrounded by canals to evacuate any excess water. 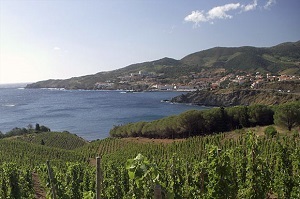 As well as the inevitable range of red and white Collioure wines, there are also red and white Banyuls, a fortified wine considered to be one of the very best in the world. To cap it all, when Pierre bought the estate, he discovered a solera of Banyuls which had been started in 1920 then abandoned in 1960. He quickly decided to re-start it and the luxurious Banyuls Hors d'Age 'Solera' is the result. A simply stunning wine. Prior to taking over at Madeloc, Elise gained considerable experience througout Europe and both North and South America. He wines are going from strength to strength.